Fee Info: $20, Discount packages available. 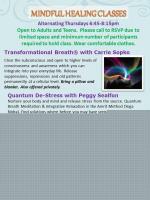 ~ Quantum De-Stress with Peggy Sealfon: Nurture your body and mind and release stress from the source. Quantum Breath Meditation & Integrative Relaxation in the Amrit Method (Yoga Nidra). Find solutions where before you may have seen only problems. Rejuventate & reconnect with your true self. Feel refreshed & empowered to tackle life's challenges. Clear the subconscious and open to higher levels of consciousness and awareness which you can integrate into your everyday life. Release suppressions, repressions and old patterns permanently at a cellular level.